With billions of pounds of cargo transported each day, the air cargo industry has a critical obligation to protect the public from security threats without hindering operational efficiency. For the identification of potential explosive threats, carriers have historically relied on X-ray screening and explosive trace detection, but these technologies have yielded costly inefficiencies. MSA has developed an innovative screening process to address the industry’s needs. MSA’s patented Advanced Alarm Resolution addresses the Air Cargo Industry’s screening needs with best-in-class protection against explosive threats. The innovative sequence of three proven MSA explosive detection screening solutions blends state-of-the-art technology with uniquely-qualified subject matter expertise to provide unmatched value. screener as the Windsor Team continues screening additional cargo. 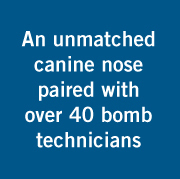 analysis and resolution by MSA’s FBI Trained bomb technicians. MSA Security® was issued U.S. Patent No. 9,922,386 on March 20, 2018.